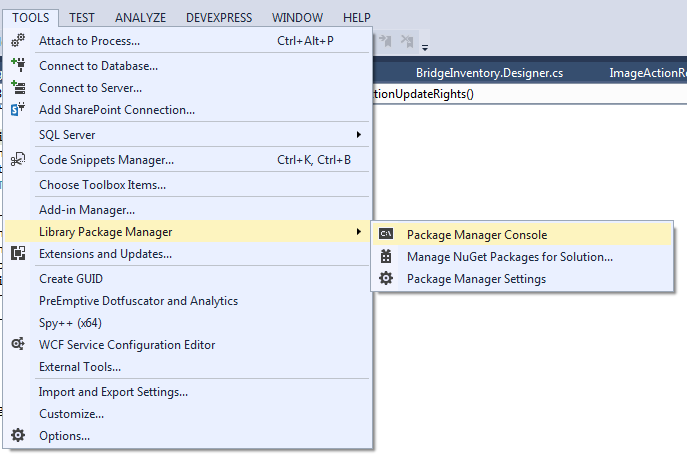 Visual Studio 2013 does not support MVC 3 in a “first-class” way. Therefore, it is desirable to upgrade MVC 3 projects to MVC 4. A tool exists which is very useful to accomplish this, but some additional steps might be necessary (as we found). “Install” the UpgradeMvc3ToMvc4 package. Be sure “Default Project” (top bar of console) is set to the correct project! Uninstall the package indicated in the “already referencing” error. Ignore the warnings about breaking packages. Then try the upgrade again. You may need to uninstall several packages before the install succeeds. If any unit test projects or other dependency projects exist, they will need to be upgraded as well. Change “default project” on the top bar of the package manager console to these projects and run the install command again. Some errors may happen here, generally this is OK. The main point is to update the references automatically. If this does not succeed, these references are relatively easy to update manually. Make them match those in the web project (which was already upgraded). Attempt to “Rebuild Solution”. It should be successful (no errors). Check for Model intellisense in the view. Should work. Run all tests. Should pass. Go to web project’s primary Web.config (in the root of the web project). This is to switch back to Windows authentication. Otherwise the app will try to use forms authentication even if it previously used Windows authentication. If this is your first web project in Visual Studio 2013, you may also need to configure IIS express to support Windows Authentication. Follow these instructions: http://stackoverflow.com/a/19515891. You only need to do that once per machine. In the ASP.NET MVC world, Microsoft has provided an interesting technique for data validation: data annotations. Data annotations are lightweight, and, using Metadata classes (shown in the previous link), data annotations can be applied effortlessly to entity framework or datatset generated models (for database-first uses). This technique has been very convenient for our EF/MVC applications. None of these fit well with data annotations. However, there is a way forward: the blog post “Data Validation in WPF” includes a bit on implementing data annotations with the help of a validator class. Unfortunately, this approach does not support metadata classes! To work with generated data classes and metadata model validation in WPF, I have extended the above exchange to support validation rules in metadata classes. In this way, you can share your metadata validation rule classes between WPF and MVC applications with no changes. For the model class that you want to provide data annotation support to, extend it with a partial class implementing INotifyDataErrorInfo. The implementation is completely boilerplate, and you could extend your code generator template to include it. For this example, my model class is called “Bridges”, as it is directly derived from the table of that name in the database. I’ll assume we’re going to add a metadata class called “BridgesValidation” to validate some aspects of this model. To begin with, we can create a partial class for the model, adding an interface for INotifyDataErrorInfo and attaching the metadata class in the usual way (the same way you would with EF database first). Next, we need to provide the interface event, and prepare a dictionary for storing which fields are in error. The method will simply lookup in the dictionary to see if the requested property is in error. How (and when?) to calculate which fields are in error? I created a calculate errors method, which I attached to the column changed event notification for the model (which derives from DataRow). You could just as easily attach to the property changed event notification for the model. Depending on how the model is implemented (DataRow, EF, etc) the exact attachment procedure will vary. In any case, however, a boilerplate error calculation routine can be used. First, clear all existing errors. If deriving from DataRow, could also call “ClearErrors” here. Second, acquire all metadata class types (this is the interesting bit that the above link does not include). Finally, look through all classes and all properties to find any validation attributes. When the “Add” is called on errorsForName, if using a DataRow derivative, that would be a good time to call “SetColumnError” as well. Now you are ready to use data annotation validations in WPF! Simply use the same kind of data annotation metadata class as you would for an ASP.NET MVC application, and use the above partial class template to extend each generated model class file. WPF will pick up the INotifyDataErrorInfo, which will in turn provide a seamless link between the metadata class data annotations and the WPF user interface. Normally in .NET the garbage collector eliminates any concern we might have regarding memory leaks. However, there are certain cases where “lost” objects may be retained because references to them still exist. One possible mechanism for this is event wiring. Imagine the case where a host component, like a main application window, contains an object which can notify of changes. The main window instantiates a child component, and sets a property on the child to the observable component. The child component then begins to listen for changes. This adds a reference to the child window to the listener collection of the observable component. Since the observable component is long-lived, that reference will persist. If the child component is created and destroyed many times, a noticeable memory leak may result. Let’s create a simple main and child components (in this case, windows). The main window will own the reference to the observable item. The child window will accept it as a property, and listen for changes on it. Very important to note that these components do not need to be windows; they can be any created and destroyed component. And here’s a framework for the child window. Notice I am omitting the event wiring, which will occur in the setter. This is the point of difference and where weak events will come into play. The assumption is some control is databound to the Sum property and will receive notifications of changes via Window1’s PropertyChanged event. For testing purposes, we can rig up a simple timer on the main window which will create and close many child windows. The timer will simply invoke ShowCloseOtherWindow every, say, 250 ms or so. 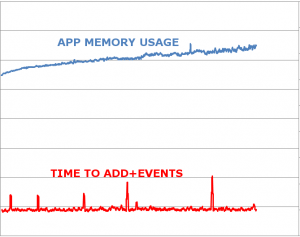 We can then monitor the memory usage of the application with different notification techniques. To monitor memory usage, I’m using perfmon on the specific process. To monitor performance, I’m using a Stopwatch instance around a call to .Add in the main window. This Add occurs every 30 seconds. When the Add (or any other change) occurs, the observable collection notifies all listeners. The time taken to notify all listeners is monitored by the stopwatch. To establish a baseline, I will start with the empty implementation of the Items setter. This is obviously unacceptable in practice, since it does not result in changes (or even the original value) of the Items being exposed to the Sum calculator. 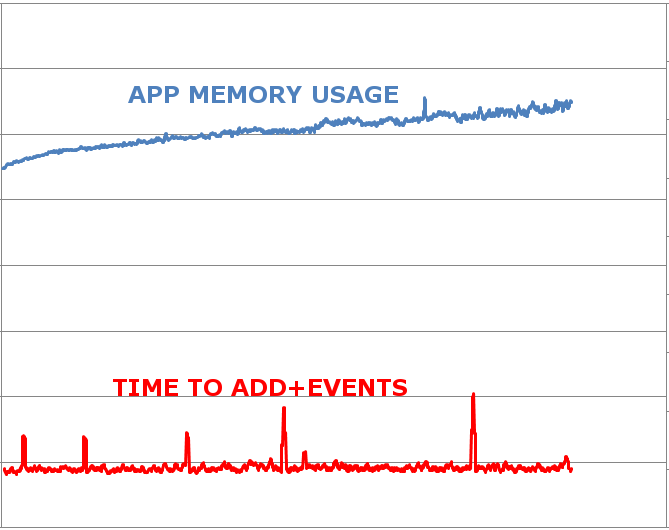 In this diagram, overall app memory (blue) and time to add item (red) are indicated. Overall memory usage increases slightly over time (as expected), since items are continually added to the collection. Since the collection is never actually listened to or processed in any way, time to add stays relatively flat. This seems very reasonable: it ensures that the items collection can be changed, and that extraneous events will not cause a recalculation. Nevertheless, this implementation hides a dangerous flaw: By adding the listener, the items collection now has a reference to the component (in this case, an instance of Window1). If the component is intended to be discarded, the garbage collector will not collect it because a reference still exists (from the items collection). This causes a memory leak if many instances are created and then discarded. Furthermore, since the “zombie” components are still listening for changes and still recalculate the Sum on changes, as more and more instances are created (and zombified), the processing overhead of adding values will increase dramatically, causing a time leak. 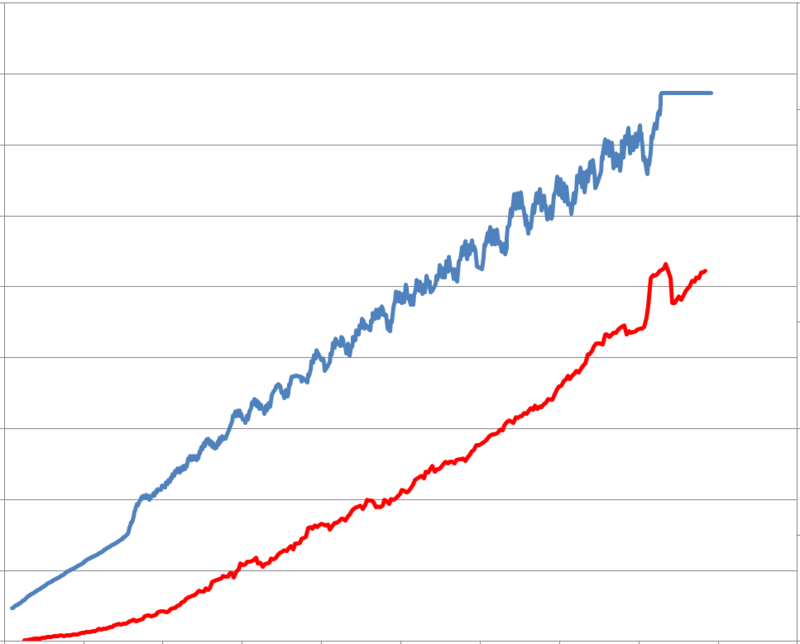 Let’s run the program again, with the same instrumentation on memory (blue) and time (red). 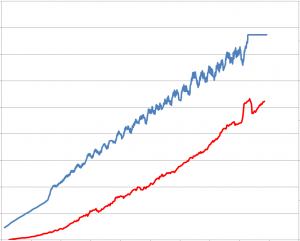 Notice how both skyrocket quickly (time usage even increases polynomially). The flat line of memory at the end is where the program crashed! Hopefully you can see how aggressive this kind of memory/time leak can be and how insidiously difficult to locate it it might be in a large and complex program! The “obvious” solution is to use IDisposable and dispose of the object, having the Dispose method remove the event listener. In some cases, disposing of objects is tricky and we want to allow the garbage collector to work. For the remainder of this article, I will assume we want to find a garbage collectable solution. Problems with garbage collection can sometimes be addressed using “weak references”. A weak reference tells the garbage collector not to count that particular reference when considering whether an object can be freed or not. Thus, if we modify the event handler above so that it is a weak reference, the garbage collector will still be able to collect it, and the problem (both time and space) will go away. However, this is not as trivial as it seems. Although .NET has a WeakReference class, this class only supports object references, not delegates (and by extension, not event handlers). What we really need is a “weak event” mechanism. Several solutions exist. In general, an intermediate static object which maintains the weak references and dispatches events as appropriate is needed. In many cases, developers have needed to write these classes themselves. For example, see the detailed Weak Event Handlers blog entry by Steven Hollidge. There is no need to modify the event handler or write any other boilerplate code. The result? Memory usage and time increase slowly as items are added to the collection (which is exactly the expected behavior). 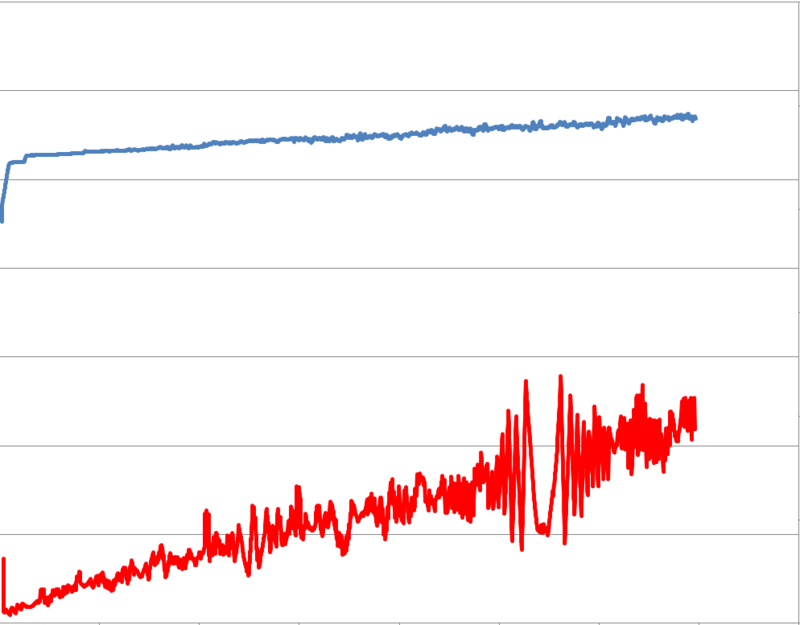 The time increase is due to the calculation of sum which now occurs, whereas in the first graph, since the event handler was never wired, no sum calculation ever occurred. Download the complete WPF Weak Reference demo source code, including both techniques and instrumentation. A comprehensive article dealing with weak events in all their facets is available by Daniel Grunwald.